When should I begin to consider using a warehouse? Are promotional giveaways still effective? What are some best practices for Inventory Management? 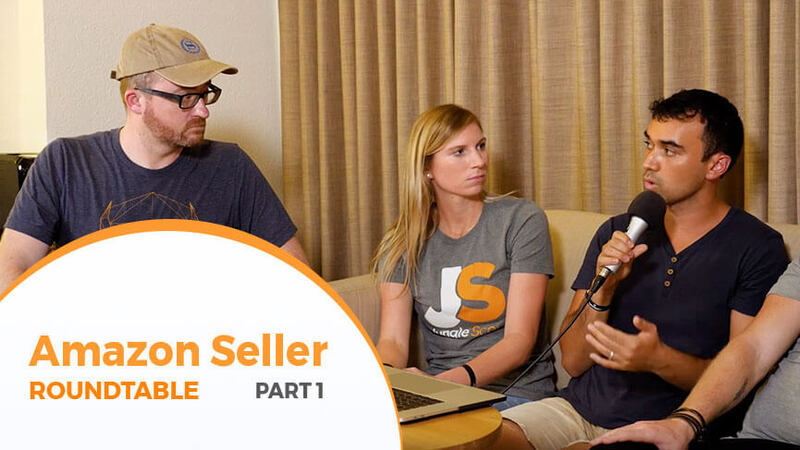 We’re covering all of this today in Part 1 of this 2 Part series of the Seller Roundtable: Jungle Camp Edition. Watch the video, keep reading and don’t forget to subscribe to our YouTube channel so you never miss a video update! Welcome to Seller Roundtable: Jungle Camp Edition! Today’s blog post is Part 1 of a 2 Part series of this special Jungle Camp edition of Seller Roundtable. Jungle Camp is a bi-annual event at Jungle Scout where we get the entire team together to work and play. What are some of the biggest changes to Amazon FBA in 2018? Elizabeth: One of the biggest ones for me was the change of inventory management going from every six months to every month, and making sure that your inventory stays under that six-month mark so you’re really, really moving your inventory and helping Amazon keep their inventory levels inside of those warehouses down and under control. Dave: I had a lot of inventory that was kind of slow moving in various Amazon fulfillment centers and I had to pull a lot of it out because now with Amazon, if you’ve had inventory that’s been there for more than 365 days, they’re hitting you with a monthly $.50 per unit charge which is a lot different than it used to be. Used to be by volume and they’ve switched it over to per unit. The cost to remove inventory, if you have it sent back to yourself, is $.50. So obviously they’re saying, hey, take this stuff out if it’s not selling. How can I avoid Amazon’s storage fees? Ervin: What I’m doing right now with my inventory is I’m sending part of it to a nearby warehouse, where I have it stored, I think I pay $9 a pallet to just have it stored there, which isn’t too bad. And then I just send inventory to Amazon as needed, that way I don’t get hit with long-term storage fees and I don’t have to pay for the inventory rule of $.50 per unit. Lenny: I’ve never done that before. Is that very easy and straightforward to do? Ervin: It’s fairly easy to work with a lot of these warehouses. Often times you can just Google Amazon 3PL, 3PL means third-party logistics warehouse. They already know the procedure, often times they’re located near these Amazon fulfillment centers so it’s cheaper for you to ship from the warehouse to Amazon as well. Ervin: That’s a good question. For me, 500 units would probably be the threshold to where I keep things on Amazon just because 500 units can easily sell on Amazon. I would say maybe if you’ve ordered 1,000 or more, you may want to keep about 600 on Amazon and 400 at the warehouse just so you can have inventory sent on the go. Dave: At least always have enough inventory on hand so that you can account for lead times and things like that, and then any excess just keep it in your garage or as Ervin said, use a third party or something like that. It doesn’t have to be super complicated; I just keep my stuff in my garage. Elizabeth: What I do is I try to turn all that inventory within 90 days, and my max is 6 months. So if I’m not moving that within 6 months, and if I’m starting to approach that 6 month mark, I’ll actually backtrack and figure out how much I’m going to pay in long-term storage fees, I use that estimate, and that’s how much I discount my products in order to make up for that. Because I’ll spend money shipping that to another warehouse, so instead of spending that money and moving it out of Amazon and incurring removal fees and any of the logistical charges, I just use that as my coupon budget. Dave: If you’re just starting out take what the Jungle Scout Chrome Extension or the Web App is telling you that your competitors are selling monthly and multiply it by three. Even if you briefly run out, it’s way better than ordering way too much. Ervin: Something on top of that is I’ve never really been too good at inventory management, but one app and tool that has helped me tremendously is Forecastly. I just plug in my numbers from each of my suppliers for each of my products, it’ll already plug into Amazon, looks at your daily sales, and even forecasts how many extra units you should order based on your current volume. Joel: I totally agree, Forecastly has been tremendously important. And also, seeing that buffer, if you can continuously look at your past sales and you’re noticing trends of 10 to 15% in growth, make sure that your next order you apply that growth. Lenny: I totally agree that Forecastly is a really great tool to use. I’ve used that personally, and that’s really helped. But also, Fetcher has a great feature if you’re using that for your profit analytics, that also tells you how many days remain on inventory that you have left. PRO TIP: Create a calendar and mark all the Chinese holidays as well as Amazon related dates like Prime Day and Black Friday and calculate from that when do I ideally want to have stock in and what’s my lead time, so you know by this date I really need to place an order so that it gets in on time. Ervin: Sure thing. Launching a product these days doesn’t really differ a whole lot from how you would launch a product back in 2015, 2016, or 2017. But I firmly believe these days in order to launch a product, Amazon looks at your data and the sources where the traffic is coming from. So giveaways, yes, they still work. They still have a tremendous effect on your ranking and BSR. But I feel like you need to couple that with other stuff that you can do. So stuff like ManyChat, which we’ll go into later, also you’ll want to couple that with PPC. One of the things that I’m really fond of these days would be Amazon Giveaways. Have any of you used Amazon Giveaways? Elizabeth: They’re awesome. Super, super useful. Ervin: How it works is you tell Amazon for every, say, 2,000 people, 1 person will win. But one key thing that Amazon puts in here is, in order for someone to enter the sweepstakes, they have to either watch a video or follow you on social and things like that. So not only does that increase your followers on social, but you can even sell the product to the customers who are entering the free giveaway. Joel: It’s just such an easy way to get these people that normally would have never known about your product to really simply purchase it. And they’re not worrying about reviews and stuff because they just watched this video and they’re like that’s kickass, I want to watch it, or I want to buy it now. Dave: Joel and I were having a conversation about this in the hall, the first place you start if you want good reviews is the product itself. You sell a good product, you give a good experience, you follow up and make sure that people are happy, you’re going to get good reviews. Promotions and giveaways just accelerate that. What are your best tips for Amazon PPC? Joel: If there is one thing that you should actually put a lot of time into and be very, very careful with, it’s PPC. It’s all about getting creative as much as possible. The more creative you can get, you’re going to pick up sales that no one else is going to get, and your cost is going to be incredibly low. Elizabeth: Especially those lower cost ones. Like, those lower keywords that you’re not paying as much for. If you really put a budget into those, I’ve seen huge results from that. Lenny: I guess even if they’re not getting the same overall volume that you’re used to getting, those longtail keywords or less known one’s sort of add up. Should I turn on Amazon PPC at launch or should I wait to have reviews? Ervin: I absolutely believe that you should turn PPC on straight away, on day one. I believe that once you start selling your product, once the product is listed and live on Amazon, then that’s where the clock starts ticking on your window of opportunity. And, you know, it’s as easy as creating an automatic campaign, or for me, I usually create one automatic campaign, and I also create one broad campaign and let the keywords drip in. Carrie: I definitely agree that you should do PPC right away. But, something I actually do, because there’s data analysis that you really need to do, and you really need to be in it all the time. So, I actually outsource my PPC through Jungle Market. These are vetted freelancers that are just in it, and they’re experts at it. Because you can either really gain a lot of sales, or you can lose a lot of money by doing PPC the wrong way. What are some other strategies to help drive traffic and drive sales? Carrie: A good strategy is giveaways on Facebook. A great thing to do is do a giveaway on Facebook for whatever your product is and then set up a chatbot through ManyChat. The cool thing about using chatbots on Facebook is that people are opening them a lot more than you would an email. So, you’re having a lot more connection with customers or potential customers. So, ManyChat is a great way to do giveaways, a great way to communicate with people and send them to your Amazon listing for some great sales. Elizabeth: What are those stats? Those stats are crazy, right? The average open rate for email is less than 15% and the average open rate on ManyChat is above 80%. It’s absolutely staggering. Any tips for listing optimization? Joel: Still to this day, photography, it should be the number one thing that you invest money in. There’s a lot of things online that say DIY photography. I have a very expensive camera and I feel like I’m a pretty good photographer, however, that is one thing I do not want to touch. I want to actually hire someone that knows what they’re doing and understands Amazon’s Terms of Service. With Amazon, there’s so many sellers these days, and you really need to separate yourself. Try to get as creative as possible with everything you do and photography is a really big part of that. So, instead of just putting up my product photos, I will take the first line of all of my bullet points and I’ll add that line to each of my photos (excluding the main photo). Carrie: Another great thing to do is to take some reviews from what you already have, and put it in the pictures, obviously not your main picture. But, because people aren’t always clicking on the listing until they’re really intrigued, if you got some great reviews, like short ones, that you can put on the photos, that’s a really great way to get them thinking, “Oh, well people like this,” and then they just start to read more. Elizabeth: One thing on photos that’s really important, whether you’re using Jungle Market or taking your own photos, is the lag time between editing and getting on the books of your photographers, and making sure that you can get the final photos on your listing so you’re not waiting with low-quality photos while your listing is live with full inventory. So, you should get a sample and air freight it over to yourself and get it to your photographer, whether that’s you or somebody else, get that straight to them so when your product hits Amazon’s warehouses, you have great photos. Carrie: Something else that you should have already thought out is what exact pictures you want for your photographer to take. I think that communication is the most important thing when it comes to a photographer, so be as specific as possible. Elizabeth: I screenshot photos and send those photos to the photographer. Carrie: Yeah. Screenshot examples or photos, anything you can do to really help them understand your vision is really, really important. I think that’s where people always fall short on and it actually increases your lag time. If you don’t communicate appropriately with the photographer, then they’re going to take more time, and then it’s going to take more time for you to get your listing up. Joel: I actually have it part of my contract with my supplier that every single time I place an order, they have to send a sample to my product photographer. As soon as you’ve placed that order, make sure that your supplier ships off a sample. Practice good inventory management to avoid Amazon storage fees. Tools such as Forecastly and Fetcher can help with this. Get creative with any excess inventory that you have on hand. If possible, store your excess inventory in your garage or use a 3rd party logistics warehouse. Get creative with your keywords and seek out those longtail keywords. If you need help optimizing your PPC campaigns you can hire a freelancer that specializes in this space through Jungle Market. Invest in your product photography and don’t delay to get this done. You can find Amazon product photographers through Jungle Market.